The Sea Dogs were on the losing end of a pitcher's duel in game one of Thursday's doubleheader. Portland was held to four hits, with Cody Decker driving in the team's lone run. Teddy Stankiewicz took the tough loss, lasting four innings. He gave up two runs on three hits while striking out five and walking one. The deciding blow against Stankiewicz was a two-run homer in the fourth inning. Portland flipped the script in the nightcap of the doubleheader, with Ryan Court coming up with a clutch two-run single in the bottom of the sixth. Kevin McAvoy pitched a seven-inning complete game, allowing one run on five hits. He also walked three and struck out five. Mauricio Dubon hit a key double in the sixth to set up Court's heroics. Yoan Moncada did not play in either game as he continues to battle a sore ankle, according to multiple reports on Twitter. In what is becoming a regular occurrence, Michael Kopech was absolutely dominant on the mound. 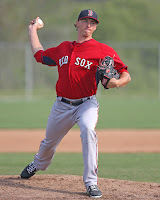 Matching his single-game season high in innings pitched and strikeouts, Kopech earned his third win with Salem. He lasted six innings, giving up one run on three hits. He struck out 11 batters and walked none. Bryan Hudson went 2 for 4 with an RBI. Rafael Devers was held hitless in four at-bats. The Drive rode a solid outing from Roniel Raudes to a win on Thursday. The 18-year-old hurled seven innings of scoreless ball, allowing four hits and just one walk. He also struck out four. Victor Diaz picked up the save with two innings of no-hit relief. He walked one and struck out two. Roldani Baldwin and Nick Lovullo drove in the team's two runs. In a season filled with walk-offs for the Spinners, Thursday's may have been the strangest. After Ryan Scott singled and Chris Madera failed to bunt him to second, Scott ended up on second anyways thanks to a wild pitch. After C.J. Chatham moved Scott to third with a groundout, Scott came home as the winning run on another wild pitch. Chatham went 2 for 5 with a pair of RBI. Bobby Dalbec led the offense with a pair of monster home runs, including a majestic 427-foot blast captured by SoxProspects Director of Scouting, Ian Cundall. He went 2 for 4 with three RBI and two runs scored. Jordan Weems blew the save in the top of the ninth in part due to a passed ball and wild pitch, but he was credited with the win. The GCL Sox blew a late four-run lead but managed to blow the game open in extras. With two outs in the top of the 11th, Juan Carlos Abreu lined a two-run single with the bases loaded to put the Red Sox up. Catcher Samuel Miranda followed that with his first professional home run, a three-run shot that put the game out of reach. Miranda went 3 for 5 with four RBI, coming up a triple short of the cycle. Abreu finished 3 for 5 with two doubles and three RBI. Marcos Lantigua was charged with a blown save, but three runs were charged to Francisco Soto. Lantigua earned the win with three innings of shutout relief. The first DSL team racked up 11 hits and rode a four-run ninth to pull away. Kervin Suarez provided the big blow with a two-run triple. He went 2 for 5, adding a double and two runs scored out of the leadoff spot. Carlos Pulido went 2 for 5 with 2 RBI. Edilson Batista picked up the win, but Oddanier Mosqueda stole the spotlight with 3 1/3 dominant innings of relief. He struck out seven of the ten batters he faced and walked none. He allowed one run on three hits. The second DSL squad was held to just three hits. Pedro Castellanos provided the team's only extra-base hit, going 1 for 3 with a double. Bryan Mata suffered the loss, but allowed just two runs on six hits in five innings of work. He struck out two and walked two. Player of the Night: While there were several deserving offensive performances, it's hard to overlook the ease with which Michael Kopech is cutting down Carolina League hitters right now. Ten of Kopech's career-high 11 strikeouts were swinging as he continues to work his fastball in the high 90's. Kopech lowered his ERA to 1.42 and now has a staggering 71 strikeouts in just 44 1/3 innings pitched for Salem. Incredibly, 39 of those strikeouts have come in his last four starts.